Time-saving Tips? Sign me up! Here are some time-saving tips from the angels at HootSuite. Everybody’s got a lot on their plate. Not to worry. HootSuite to the rescue, to help you manage all of those little social media bits and bobs that we all deal with, every day. Or just a list of important folks. Or people who can help you succeed. Whatever you want to call it, use Twitter (or HootSuite itself), to separate the wheat from the chaff. If you’ve only got five minutes to look at your social media streams, populate this list with people you must read. It’s a little Chrome extension. And all you have to do is, click the owl, pull down on the drop-down to select the stream(s) you want to add the content to (just like in the full-blown version of HootSuite), modify the content if you wish, and either schedule manually or click schedule or Auto-Schedule. 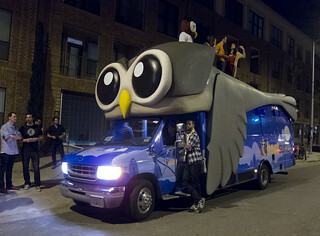 Frankly, I’m having trouble envisioning how HootSuite could make it any easier. I would add, make sure to keep these times in mind when auto-scheduling. This is what I’m doing right now! In his great book, Optimize, Lee Odden advises, in Chapter 9, to adopt an “Oreo Cookie Tactic”. That is, take content and add your own introduction and conclusion, with the content placed in between and properly attributed, of course (see page 118). I love this tactic, not only because it is an easier way to add content (particularly when inspiration is harder to come by), but also because it promotes the Rule of Thirds, e. g. one-third of social media content should be about the content creator’s wisdom being imparted, one-third should be the content creator’s personality, and the final third should be the promotion of others’ content. Evan Page has written an excellent article and I highly recommend that you read the original source material as well. His Time-saving Tips never seem to go out of style.